Here is my disclaimer, Cathal has a post explaining the correct way to install DotNetNuke on Windows 7 so that you can use the “cross-app pool isolation feature”. 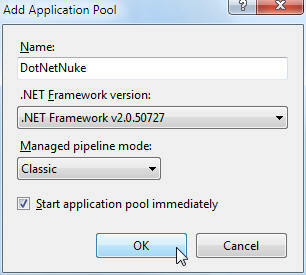 However, I posted a tutorial that explains how to install DotNetNuke the “old way” using Network Services. The link to Cathal's blog post is quoted many times all over the community forums. However, apparently it no longer exists. Where is http://www.dnnsoftware.com/Community/Blogs/tabid/825/EntryId/2420/Windows-7-Windows-2008-R2-cross-application-pool-isolation.aspx ??? ?